Hillsborough County Parks Recreation and Conservation has recognized the exploding nature of the sport and is introducing programs at some of its community centers. "We started a pickleball club with eight to 10 players at Northdale last November," said programs specialist Russell Elefterion. "Now we have 38." Elefterion said the club was formed in response to requests from seniors there. The Northdale Recreation Center provides free lessons at 11 a.m. Tuesdays and Thursdays, and club members travel once a month as a group to play teams in places like Anna Maria Island, Clearwater and St. Pete Beach. They will be coming to Sun City Center in April. Also, the Gardenville Community Center in Gibsonton is adding pickleball to its programs this month. "It's definitely an up-and-coming sport," said Dave Ramirez, recreation programs supervisor. 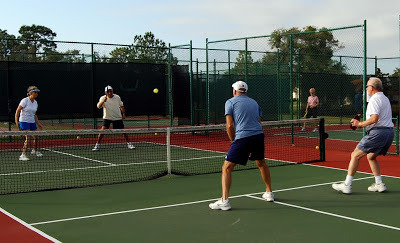 "Pickleball is the biggest event in our Tampa Bay Senior Games every October."